Once you have formed your business entity, you may need to obtain a Federal Employer Identification Number (EIN). If your company will have employees, you will need to register for payroll taxes. Next you will need to determine if any specific licenses are required to operate an appraisal management company. AMC’s must obtain a license in the states where they plan to work. Separate licenses may be required for the individual appraisers that operate within the state. Common application requirements include corporate documents, surety bond, and various policies and procedures regarding internal business operation. Applications also may require personal information from the officers and owners of the company including fingerprints so that a background check may be run. Applications fees tend to be expensive, ranging from $300 - $3,000. Licenses must be renewed annually or biennially, depending on the state. 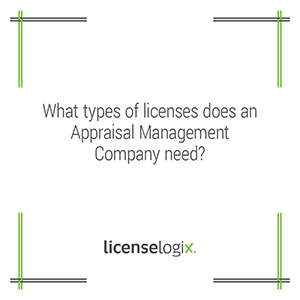 LicenseLogix will help guide Appraisal Management Companies through the entire licensing process. We can help you obtain all of the licenses and registrations you need, minimizing time-consuming and costly delays. AMC’s often must verify the licenses of their appraisers. LicenseLogix’s verification service is a perfect fit! For additional help you can fill in the form on the bottom or give us a call at (800) 292-0909.